Not Your Typical “Bolt-In-The-Neck” Frankenstein. Butler Community College’s Theatre Department is performing “Frankenstein: A New Musical,” a musical version of Mary Shelley’s classic novel of the same name. For this musical, the novel was reimagined with music by Mark Baron, book and lyrics by Jeffery Jackson and story adaptation by Gary P. Cohen. This dark musical is a tragic story of romance, tension and lost humanity. 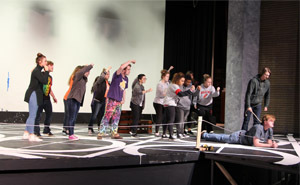 Butler’s production of “Frankenstein: A New Musical” is directed by theatre professor Samuel Sparks. Music professor Matthew Udland serves as the music director. The Technical Director and Lighting Designer of the production is professor of theatre and speech, Bernie Wonsettler. The musical is being choreographed by dance faculty Gigi Gans. Caden Middlebrooks of Maize stars as Victor Frankenstein. Elizabeth Lavenza, Victor’s fiancée, is played by Kalene Blanton of Benton. Lind, the 6’6” sophomore from Marion, will portray The Creature. Tickets: Purchase tickets from 1-5 p.m. at the Box Office in the Fine Arts Building or call 316.322.3262 or go online at www.butlercc.edu/boxoffice. Price: $5 for adults and $2 for students and seniors. Butler students get in free with Butler ID.